Livejournal is an official spam sponge. Argh. I would have posted "I will vote for the opposition" had the IC number thing been removed. Molly really, really loves this sentence. Occasionally, The Straits Times does some bad reporting that turns out to be unwittingly solid. The paper telling us that PM Lee is actually concerned about the statistics (Singapore's unemployment rate) than about the people themselves. That is why he thanked the people for nice unemployment figures. Thanks to your sacrifices, the statistics are kept pretty. It's not so much your survival that concerns me, but how you contribute to the country's image as measured by numbers. Lee Kuan Yew: If Mr Mah is unable to defend himself, he deserves to lose. Mah Bow Tan: A general election (GE) is not about me, an individual minister or an individual MP. It's really about the residents themselves. I offer myself up for election because I believe that I can do the best and the most for them. But ultimately it's for the residents, the people to decide. True, the people decide. But the people decide whether he can best represent their interests. If it is not about him, the people should have no qualms voting for the opposition for he must be quite irrelevant. Mah: There's no question that our policies are designed for the good of the people. And perhaps there is no question whether your policies have turned out to be good for the people, Mr. Mah. Everyone should remember MM Lee's words. If Mah is unable to defend himself, he deserves to lose. Wisest thing Lee has said for a long time. For the opposition . . . one scholar or two [and] you think "wow" this is a luminous transformation. Well, it is a significant development ... but finally let's look at the person, not what degrees he has, but what he is able to do for Singapore. I can tell you, we interview many scholars and each time we field a few of them. And we interview other people too and we often field people who are not scholars. It is good to see it in perspective. We hope that anybody who enters politics is somebody of not just ability but integrity and commitment. These are young people who have got good records academically and been in the civil service. Nonsense, Hsien Loong. If it is about the sorts of people and what they can do, why privilege good academic records and evil civil service experience? That's not any better than deciding on candidates based on whether they have scholarships, you know? And it is obviously political suicide to have a party consisting solely of scholars, so these are just empty words that amount to no more than a cheap attempt to take a stab at the opposition. It is not about what you can do, Hsien Loong. I happen to think that you are capable of doing lots of things including what I would want you to do, really. But whether you will do those things is another matter. Ultimately, it is what you stand for that matters to me. If you are the embodiment of my misery, I do not care who you are or what you can do. In fact, the more capable you are, the more worried I would be. It doesn't matter what you can do if you merely stand for your father instead of standing up against him. 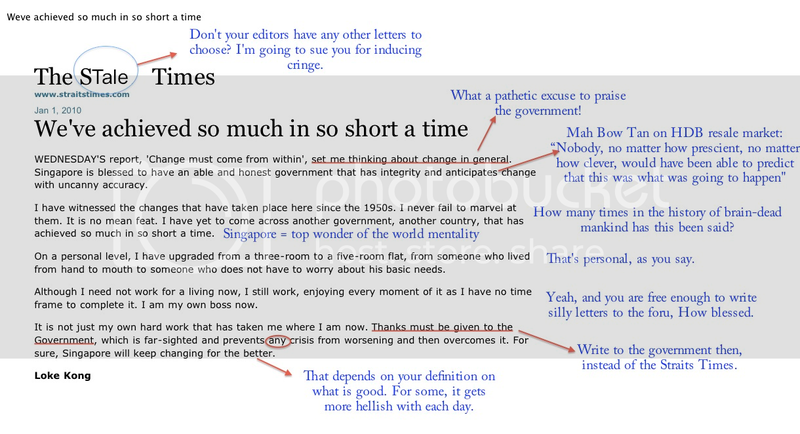 A letter featured in the world's most screwed up paper: New ugly Singaporean. HERE is a new breed of Ugly Singaporean more sinister than the ones who cut queues, pile up the buffet plate or rush onto the bus before other passengers can alight. Those belonging to this new breed fancy themselves as keyboard warriors and deface Internet sites with postings that are plainly worrying. Hiding behind the anonymity of the Net, they post comments that reek of prejudice, racism and envy. For instance, it is virtually unavoidable these days to read anti-migrant comments online. These netizens flood message boards with anti-foreign worker vitriol that degenerates into childish name calling and personal attacks on those who are courageous enough to defend foreign workers. This is a ridiculously simplistic way of putting the issue across. Either the writer is stupid or he is worryingly sinister. He would like to have us think that there are two camps: the evil anti-migrant people (apparently the majority online) and the heroes to are pro-migrants. While it might be commendable for people to defend others (migrants or not) from prejudice, who is to label one group of people "anti-migrant" to begin with? Suddenly the large number of people feeling unhappy with the foreign policy as it is manifested in Singapore are dismissed as the bad guys who "flood" message boards. On the other hand, political sycophants are elevated to the status of heroes even if their objective may simply be to defend the policies of the ruling party rather than to put an end to discrimination. Childish name calling? Personal attacks? Keith Garard Tan, the writer of the offensive letter, seems to be doing exactly that. And he is truly sinister to this bimbotic blogger. If you voice out when you think you have suffered an injustice that is perpetrated by the very government that you have "voted" in, you are guilty of the sin of envy. Is Tan as stupid as to really think so or does he have a political agenda in saying so? One can never quite tell. But, either way, the letter stinks. These ugly warriors use labels like 'traitor' frequently. The irony is that these same anonymous posters say they want to leave Singapore because they feel they are being forced out by foreigners taking their jobs. What is so ironic about wanting to leave Singapore after labeling others as traitors unless Singaporeans who desire to leave Singapore are traitors in the eyes of Keith Gerard Tan? If there is irony, perhaps it is that Tan himself is anti-migrant and is labeling aspiring emigrants as traitors. The second irony is of course that it is ironic how Tan is speaking of irony. But perhaps Tan's real concern is as follows. Another example: The Eric How controversy, in which an inflammatory Facebook diatribe by an unidentified individual who called himself Eric How and claimed to be a member of Young PAP triggered a witch hunt. Did he just say "another" example? Pardon me, but what was or were the previous examples given? In any case, I have to confess that I do not know what Tan is driving at. Is he saying that the supposed impostor is an ugly Singaporean? But that one impostor should not be considered a "breed" of Singaporeans. Is he saying that those involved in the so-called witch hunt are ugly Singaporeans? Hey, but why should pro-migrant people be considered "courageous" while those who want to defend Singaporeans against the accusations of "Eric How" not courageous people who take the effort to expose those who post the inflammatory remarks to which Keith Gerard Tan seems so opposed? Apparently, it's good to defend migrants, but it's bad to defend Singaporeans or attempt to expose someone who makes remarks saying that Singaporeans have their karma to blame for their plight. Those in this new breed of Ugly Singaporean worry me because they suggest a sense that beneath a placid exterior lurks a collective subconscious that is intolerant, mean and narrow-minded. People like Keith Gerard Tan worry me. They either show how stupid Singaporeans can be or how far some would go to assassinate those who are critical of Singapore as his political gods have made it. A REPUTABLE preschool is seeking a teacher for English and in its newspaper advertisement, it specified 'Caucasian' as a criteria. In 2006, it was 19.7 per cent. The plunge is a feather in the cap for Tafep, which released its first progress report on Wednesday. Fewer discriminatory ads? But who cares about ads? The most politically correct ad does not guarantee the fairest employment practices. 1. You deserve to be molested if you go to parties. 3. Women going to countdown parties should expect to be molested. 4. It’s normal to be molested. Especially if you are “wild”. 5. Many cases of molestation makes molestation OK.
6. Erm . . . maybe molest women in private instead? 7. It's your fault that you did not sufficiently protect yourself. Disclaimer: Although everyone knows that Molly is a wild bimbo who parties in bikini all the time, she is not the victim of the Siloso Beach molestation. She is also relieved that no one took a video of her molesting the drunk hunks in Speedos at the party. They totally deserved it for their partying ways. 1) "Workers will need to up-skill, re-skill and multi-skill. They must be flexible, willing to adapt to changed conditions, and take on new jobs as conditions change." = Improve your skills (up-skill) and do more kinds of work (multi-skill). Work longer hours with lower expectations (be flexible) and adapt to harsher and harsher conditions without any real workers' rights. 2) "Earlier this year, when job prospects were uncertain, workers took skills upgrading seriously. Now that job prospects have improved, workers must not think that this is no longer urgent." => There is always this danger that Singaporeans become complacent and adopt the wrong attitudes. Terrible people. 3) "Older workers should also carry on working for as long as they can; one encouraging sign through this crisis is that employment rates for older workers stayed high." = Erase the word "retirement" from your dictionary. Erase the word "retirement" from your dictionary. Erase the word "retirement" from your dictionary. Erase the word "retirement" from your dictionary. Erase the word "retirement" from your dictionary. . . . I'm happy that old folks are competing with young PRC foreigners for cleaning jobs (one encouraging sign) while my father accuses them of not being hardworking enough. 4) "[T]he best way to protect workers is to give them the right skills to remain productive and employable, and ensure that their companies stay competitive internationally." = Workers should not be protected by stupid things like rights. We protect them by helping their companies stay competitive internationally. Let's start with depressing wages so that the companies will always remain competitive. Competitive companies are always beneficial for workers, aren't they? 5) "The	Government’s	first	responsibility	is to Singaporeans. = I say lah. No harm saying. 6) We will manage and moderate the inflow of foreign workers, so that Singa-poreans are not overwhelmed by the sheer numbers. But we must continue to welcome hardworking, enterprising people to our shores. We need them both to expand our talent pool and help Singa-pore to prosper, as well as to top up our own population and make up for our low birth rates. = When I say you are not overwhelmed by the number of foreigners thanks to my management, you are NOT overwhelmed. My word is truth, as always. 7) "Our history has been one of overcoming difficult odds to survive and prosper." = Of course, there will be those who can overcome difficulty and there will be those who can't. Let's only remember the former. Let the latter die off naturally and be forgotten. 8) "Singapore’s prospects are good. . . . Our policies are sound and we have the courage to do the right things." = Yes, you may hate what I'm doing, but trust me, it is the right thing. Because I say so.